We are closely linked to Our Lady, Queen of Apostles Church on Woodhall Lane. The parish priest is Rev Norbert Fernandes and he frequently visits our school to lead the children in mass and help them prepare for celebrations throughout the liturgical year. The children and staff also regularly attend mass with the parishioners at the church. The foundation stone of the church was laid by Cardinal Godfrey on 30th September, 1959 and the first Mass was said in the new church of Our Lady Queen of Apostles, on lst January, 1961. Cardinal Godfrey presided at the solemn opening of the church on Sunday, 4th June, 1961. The church is cruciform in plan, with seven arches rising to a height of nearly 40ft. At the rear of the nave is a balcony. Above the entrance is a 9ft. high figure of Our Lady, Queen of Apostles, carved in Portland stone by John A. Green. Early in 1986, Fr. Eamonn O’Brien invited Carmel Cauchi to have a look the church, Our Lady Queen of Apostles. He was asked to come up with some ideas to make the church a more welcoming place for worship. The challenge was enormous because, apart from the unsuitable colours used in its decoration, the church had a large window at the back of the sanctuary which dazzled the congregation. The distance from the altar did not allow the people to be closely involved in what was taking place on the altar. The sanctuary was deep. It also protruded into the central part of the transept, taking about three quarters of it’s area. There were four steps to the sanctuary and another three steps to the altar. 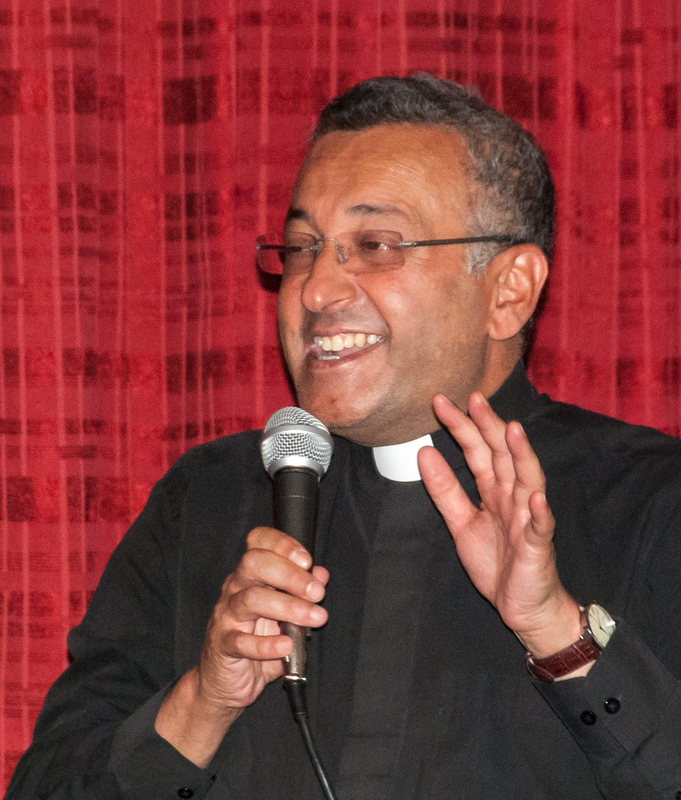 Some months later, Carmel Cauchi presented his ideas to Fr. Eamonn. The rest is history. The window at the back of the Sanctuary was transferred to the left transept, above the Blessed Sacrament. The floor of the sanctuary was lowered to only two steps throughout it’s area, finishing with an elliptical shape into the church. Against the bricked window at the back of the sanctuary, Carmel Cauchi created a welcoming figure of the risen Christ, inviting the congregation to Himself, both by gesture and size; thus making the sanctuary appear less deep than it actually is. Carmel Cauchi designed the new Altar, lectern, Celebrant’s Chair and the Baptismal Font, all made of Portland stone. Their elegant shapes relate harmoniously to the arches above them and to each other. The Processional Cross, in enamel, set in a decorative brass cross is also his work. The wall beneath the balcony was removed, creating an inviting entrance into the church. The entrance from here into the side Aisles was embellished by two arches, repeating similar ones leading into the transept. The floor was carpeted; the whole inside of the church was painted in stone-colour and texture and the ceiling was decorated with a delicate design in wood, echoing the wood of the pews beneath it. Carmel Cauchi also made the twelve tall windows that illuminate the central nave, sanctuary and transept, in stained glass of strong design and colour, creating a prayerful atmosphere. Fr. Eamonn chose their appropriate themes from the Walsingham litany. In the Church, the artist made three other stained glass windows; one of “Our Lady Queen of Apostles” in the right transept; the “Tree of Life” at the back of the church and a “Pieta” in the room of the Sacrament of Reconciliation. Carmel Cauchi is full of gratitude for the opportunity to create a house for the glory and worship of God and the good of His people. In 2002, Fr Michael Kennedy invited Carmel Cauchi back to create a Blessed Sacrament shrine for the original tabernacle on the right hand side of the Church. This would ensure that the Tabernacle would be seen soon after entering the Church. At the same time, Carmel Cauchi designed a shrine for the Divine Mercy. These two shrines have enhanced our Church. In 2003, Fr Frank Azzopardi had the Church fully decorated and a new carpet laid. The parish is very proud of the Church of today.